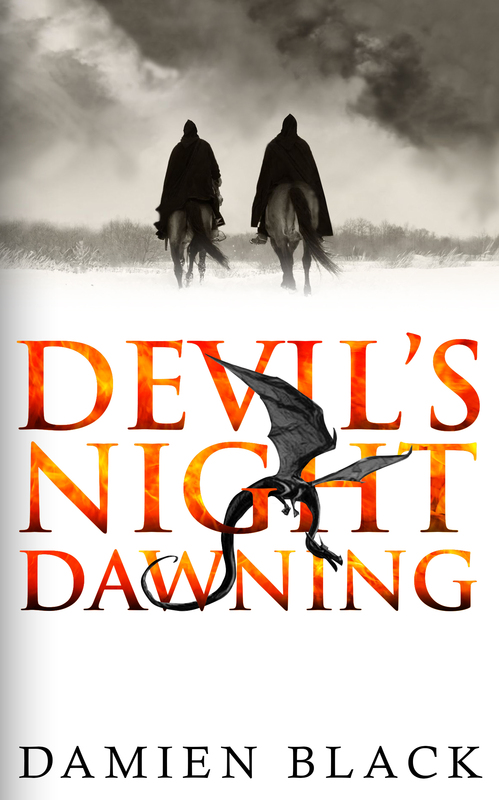 Devil’s Night Dawning (or DND) is a fantasy book heavily rooted in real world history. What I mean here is the dominant religion feels very much like Christianity, and clearly borrows from it in many circumstances, and the world itself is a classic European medieval setting. We follow along behind a bunch of characters ranging from monks performing exorcisms, knights doing knightly things, and a young noble woman trying to escape the arranged marriage laid out for her. All the while there is the threat of something unfathomably evil lurking behind the scenes, setting events in motion, and plotting the end of the world. So it sounds like it hits on many of the classical fantasy tropes… and it does. Perhaps a little too much for my liking. DND is well written and the author clearly has not only a wonderful grasp of the English language (plenty of words in this tome I didn’t know until Google saved the day), but also the know how to form those words into elegant descriptions. Not only that but the level of world building he has put into the series is on a level with Sanderson. It’s actually baffling how much history Mr Black has created around this world. Unfortunately the delivery of that world building often felt a bit dry to me. I regularly found myself reading about how sir Whatshisface fought against lord Whosthatnow in the battle of Getoffmyland, but I rarely felt like those history lessons had any relevance other than window dressing. It left me occasionally feeling like I just wanted them to get on with the story. I’ll stop to point out right now that this just means that type of world building wasn’t for me… in the same way that much of the world building in Lord of the Rings isn’t for me. It’s very well done, it’s just not the sort of style I personally in a book. The characters were a tad hit or miss for me. Our main protagonist, monk in training Adelko, just felt flat. He rarely developed any personality beyond meek farmboy following along behind Wiseoldmaster. That being said, his supporting cast of Wiseoldmaster and Oddlyarrogantsquire were very enjoyable to read. If fact, the tale of the two monks and the squire was by far the best bit of the story. The exorcisms in this book are excellent. In fact, the monster hunting, as it were, is excellent. It’s reminiscent of the Witcher (the games… I’ve not read the books yet) in many ways, in that there’s a variety of demonic beasties in the world and they require different methods of banishing. I loved this. In fact, I kinda wish the book was all about the monks travelling the land finding various evil entities and banishing them back to the fiery hell whence they came. Which brings me to the reason this one is getting 3 stars instead of 4. It felt like 2 disjointed books. The first was this thrilling tale of exorcism and demonic pursuit as two monks travel across the lands to warn the world of the coming apocalypse. And the second was a book about knights doing stuff. You can probably tell which of the 2 parts fell a bit flat to me. I just never really got on with the knights and their plight, and every time we got a chapter from them I found myself having to remember who was doing what and where, and also just wishing we’d get back to the monks and whatever beastie they were going to exorcise next. So I’m giving DND 3 out of 5. I enjoyed it, but it’s a tale of two stories and I wanted more of one and less of the other. “how sir Whatshisface fought against lord Whosthatnow in the battle of Getoffmyland” made me laugh, very descriptive. Will give this book a try as the monky bits sound like they’d be enjoyable. I don’t know anything about the Witcher games, but the books are really good, well worth reading. The Witcher books are definitely on my tbr. One day I might even get around to them.